Friday the 17th seemed like a promising day for some fall color shots. I camped out at Remersdaal hoping for a few westbounds to shoot against the forest background. Unbeknownst to me the German locomotive engineers' union had called for strike action and starting at 15:00 no traffic was coming west into Belgium anymore. So all I got were a few eastbounds working their way towards Aachen West, such as this very short edition of Captrain's aluminium flow to Nievenheim/D. Captrain 6603 on the aluminium train 48515 (Kinkempois - Nievenheim/D) in Remersdaal. Summer was exceedingly busy so I didn't get to go out and shoot much. In fact this is the first rail-related picture in 3 months. Infrabel has kept busy rebuilding the interlockings at Rue de Cheval Blanc in Montzen and here in Hindel to cut them over to remote operation. Once that is accomplished blocks 14 and 15 will be decommissioned. The cutover is scheduled to happen before the end of 2014. For Hindel this means the yard lead will be cut off and the interlocking changed to a simple set of permissive automatic block signals. The new westbound signals are already up and crossed out in this view taken off the L.38 overpass. 2805 with the 40291 (Antwerpen Combinant - Gallarate/I) in Hindel. There wasn't much time on the 13th of June but I felt I needed to get out and do something along the 480 to Cologne. Contrary to what the weather man predicted the sky was pretty cloudy but that's no reason not to go. In the event I got a few satisfactory shots including this one of one of Crossrail's Traxxes leaning into the curve with a Hupac train. Crossrail 185 578 "Christine" has the 40170 (Segrate/I - Zeebrugge-Voorhaven West/B) in tow as it leans into the curve at Eschweiler. 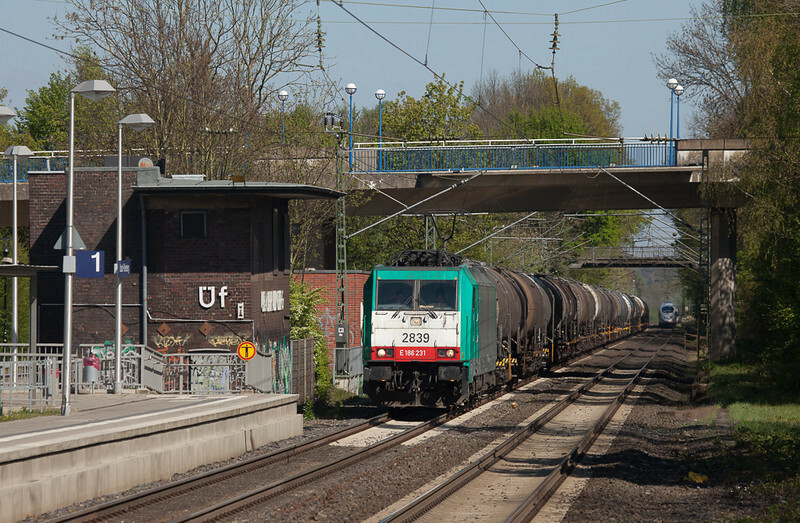 I was hoping to catch a few more freight detours on the KBS 485 so elected to spend my lunch break on the platform at Kohlscheid. Traffic levels were a bit disappointing but this detoured aluminium train made up for it as it crawled up the grade at a snail's pace. Brohltal Eisenbahn 295 049 with a detoured aluminium train Spellen (Voerde) - Koblenz in Kohlscheid. Having just returned from Sweden I had a Saturday off. With a favorable weather forecast I headed for the lovely Vallee de la Meuse. This turned out to be a very productive trip with a number of new angles and some very fortunate timings. A combination of the two resulted in this image. Railtraxx was very late with the limestone interchange to Dumont-Wautier in Hermalle s/Huy. With the light angle being as it was I needed to get on the east side of the yard and decided to try my luck along the new ravel (bike path) that hugs the Meuse river on the north shore all the way between Namur and Liege. It cuts through a number of industrial properties which for us foamers makes these areas conveniently and legally accessible. What more could one ask for. This view was taken standing atop one of the WWI-era bunkers that protected Liege in a ring around town. The buildings on the left are the river boat and truck loading terminal. Railtraxx 1266 035 D-DISPO with the 61441 (Hermalle - Kinkempois) in Hermalle s/Huy. I had to be in Stockholm again in May and this time the trip included a weekend as well. The weather was fine and I put it to good use continuing my exploration of the railroads of the capital region. The only late afternoon I had available to go see one of the few freight locals in the area turned out to be the only day with overcast and drizzle. But then that's not necessarily a bad thing as it takes away the need to worry about light angles. Here, then, we see one of the neat T44s arrive with her train of moveable sidewall cars for the ferry port at Värtahamnen. 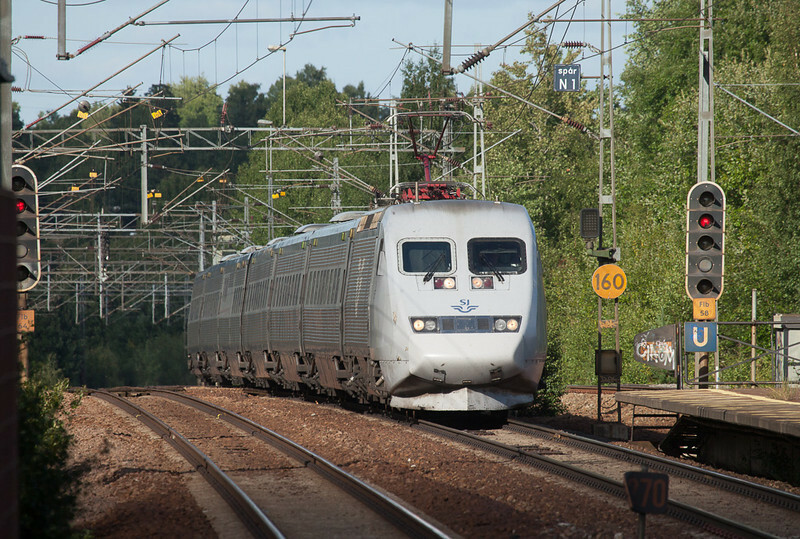 More pictures of this and a number of other trains are now in the Sweden gallery. Green Cargo T44 345 on the 4543 (Tomteboda 18:35 - Värtan18:46) in Värtan. In another view from the 26th we are back at Vise-Bas, always a favorite place to shoot. 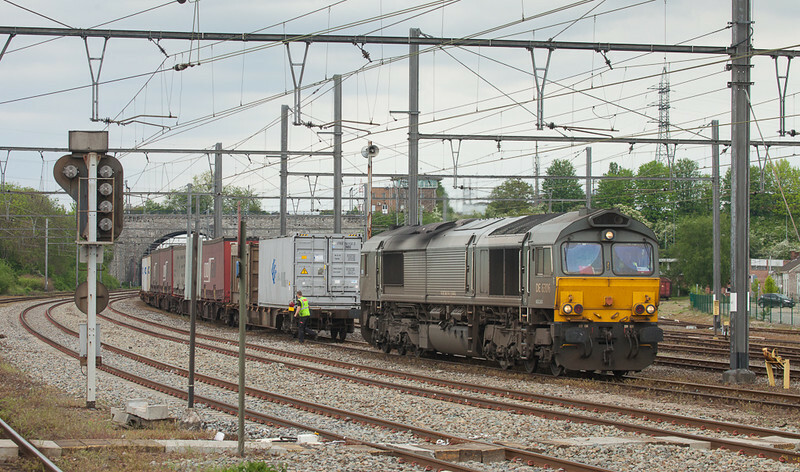 One of the few remaining gray Crossrail 66s has just rolled into town with the intermodal out of the new terminal at Geleen-Lutterade. The brakeman has uncoupled the motor for the runaround move and is fixing the EOT markers. The driver was in a hurry to get to Aachen West and mark off for the weekend which meant the train left Vise around 45 minutes early. Even with the roundabout routing Crossrail is putting on a pretty efficient show; certainly one of the reasons they're eating more and more into B-Logistics' market share. Crossrail DE 6306 running around the 48542 (Geleen-Lutterade/NL - Sittard/NL - Vise - Novara/I) in Vise. I had a free Saturday on my hands and a few interesting trains in the forecast so I set out for some foam. Hadn't been to Flandria for a while so a visit to the neat Schulensmeer spot seemed like a good thing to do. 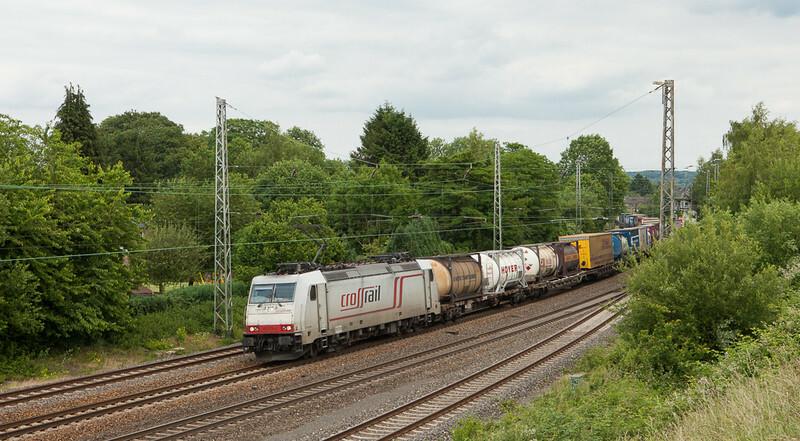 In the event I did catch Crossrail with a tank car train to Hasselt which is something out of the ordinary for a railroad that otherwise hauls a lot of intermodal freight. It is seen here just north of Schulen station. Crossrail DE 6309 with the 60248 (Antwerpen-Berendrecht - Hasselt) in Schulensmeer. This is a bit of a rushed "oh-woops-here-comes-a-train" panic shot but I actually like the tone-in-tone green of it. The terrain around the west portal of the Tunnel des Fourons is something like a rain forest, kept constantly moist by several creeks running down into the trench and the cold air out of the dual bores. The L.24 climbs eastbound at around 1% almost all the way from Berneau to Hindel, and the 66 is in Run 8 with one of the heavier trains on the line. The 55s definitely put on a better show until 2008 but in today's electric world this is the best we get. 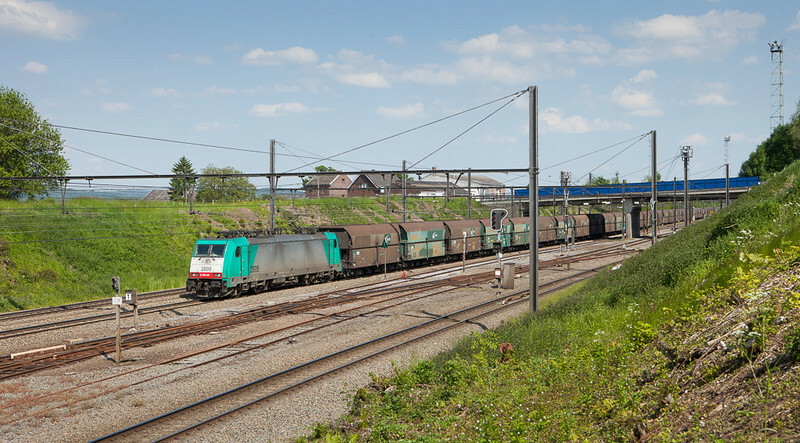 RTB/TSP V266 on the lead ore loads 48511 (Antwerp-Groenland - Stolberg/D) at the Tunnel des Fourons. I had for a long time wanted to take a photograph featuring the old disused Üf signal box in Übach-Palenberg. For various reasons it was always inconvenient - the sun wrong, no interesting traffic, or any other of a number of random excuses. With this week's diversion of freight traffic onto the KBS485 and a full day of sunshine in the forecast I used my lunch break for the purpose. Barely minutes after arriving 2839 came into view in the distance with one of the chemical tank car trains that BASF runs. There was a bit of a tense moment when the equally diverted ICE approached from behind but in the end no harm was done. A mere shade of its former self Übach-Palenberg used to be an important spot on the railroad. It featured a small yard and the junction of one of the many coal branches in the area, this one serving the big Carolus Magnus mine. 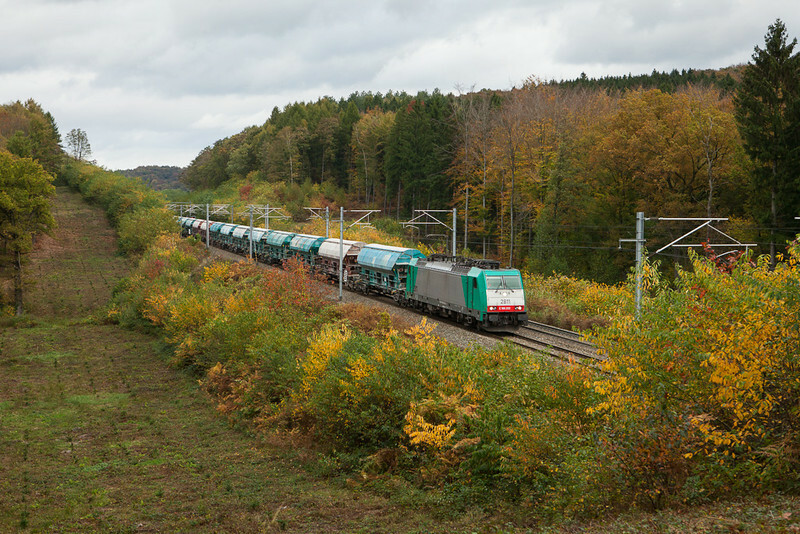 Helpers were tied onto southbound coal trains here and banked them up the steep incline between Herzogenrath and Kohlscheid, 11 kilometers distant. As usual the mine is now a shopping center, the station has been reduced to nothing but the mainline tracks, the coal comes in from Brazil and South Africa, and all the jobs in the industry are gone. 2839 on the 47562 (Ludwigshafen - Antwerp-BASF/B) in Übach-Palenberg. 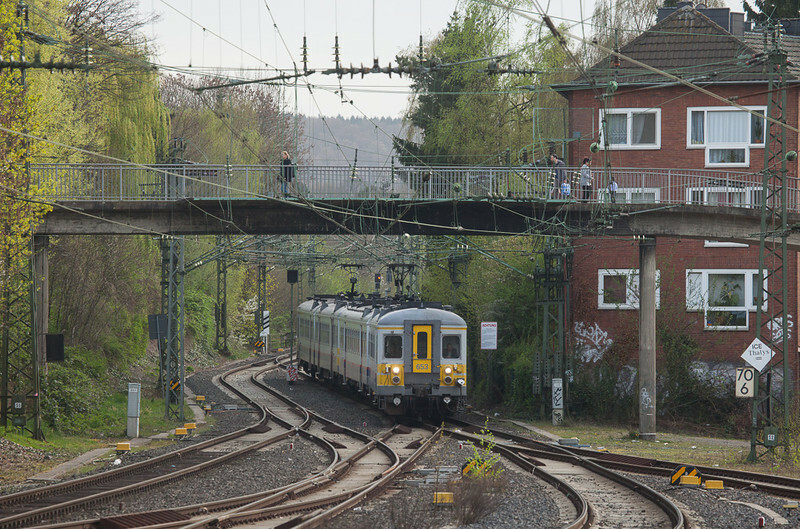 The KBS480 between Aachen and Cologne is out of service as a through route this week due to bridge work going on in Düren. As usual that means eastward freight traffic takes the northerly route via the KBS485 to Mönchengladbach, turning east towards Neuss, and then heads south to Cologne. Westbounds do the same in reverse. The upshot for us local foamers is a good flow of freight on the 485; a welcome possibility to shoot something more than the usual window trains. With this in mind I climbed atop the sound barrier south of Kohlscheid after work to partake in the pre-easterly festivities. The light was hit and miss but I lucked out with this "stealth" DB Schenker Traxx and her charge of steel carriers. I quite like the utilitarian look, devoid of any fancy graphics and other niceties. 185 318 on a steel train in Kohlscheid. I found myself back on the platform in Aachen Hbf just a week after the last time. 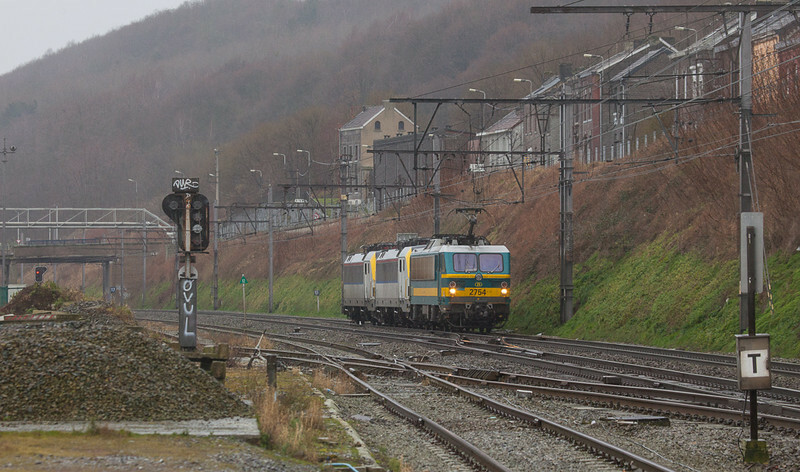 The overcast sky lent a hand in capturing one of the Liege-Aachen regional trains as it came trundling down the hill into the station. It's a nice spring Friday evening and pedestrians are heading home from work or shopping across the occupation bridge. Gone are the days of heavy freight and passenger trains being banked up this incline (which had a stationary steam engine for this purpose when it was opened in the 1840s). 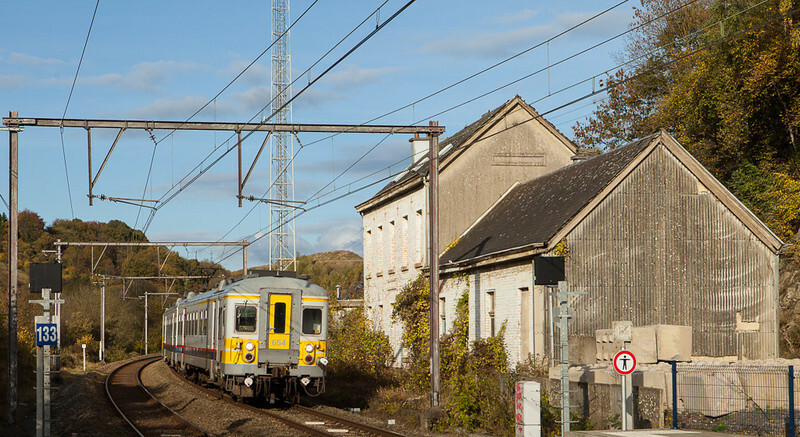 These days Thalys and ICE trainsets are the only other trains using this line. 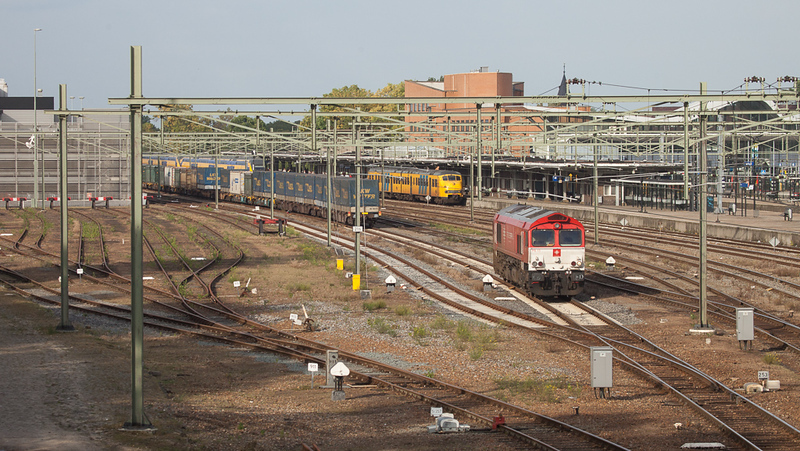 AM70 653 and 646 as RE29 in Aachen Hbf. Got back trackside for the first time in 7 weeks today. I'd almost forgotten how to shoot trains notwithstanding the fact that I took over 8000 photos while on vacation. But wildlife and rail photography are two different pairs of shoes. So what do we have here then? A sweet train in sweet light if you ask me. Crossrail's oddly-painted "raspberry" 185s have been a fixture on the Italian box shuttles for several years now. 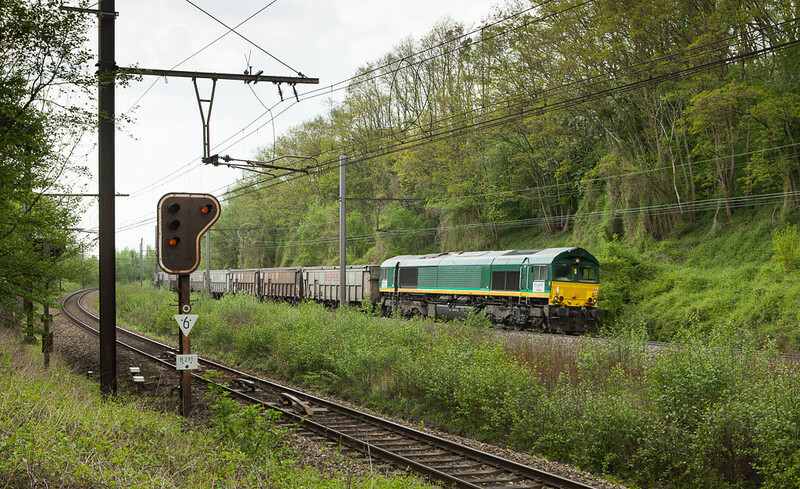 The solid P&O and Unit45 consist will be turned over to one of their class 66s in Aachen West, just a few kilometers on. Looks like spring is coming early this year, with 20+ degrees and sunshine forecast for the weekend. Time to stock up for a BBQ! Crossrail 185 597 brings the P&O train 40170 (Segrate - Zeebrugge Voorhaven-West) into Aachen Hbf. I had to be in Liege today and figured I might be able to spend some time trackside before my appointment. The storm rain and cold made me seek out a location where I could just sit in the truck waiting for traffic. The location of the old freight shed in Engis fits that bill nicely. In the event I didn't see much but this duo of HLE18s being pulled by 2754 was a nice catch. The HLE27 is one of the automatic coupler-equipped units normally used on the "camel trains". There's a regular screw-type coupler on the other end. 2754 with 1841 und 1889 in Engis. Spent a lovely sunny winter morning trackside in Eschweiler today. This place is both a curse and a blessing. A blessing because on the average weekday there is a lot of traffic and even some variety as most of the Belgian trains funnel through here wading through the normal flow of window trains. A curse because there are really only three angles to shoot so you end up with a flash card full of pictures that essentially all look the same. Sadly all traffic other than oddball track equipment or construction trains through here are electric powered these days. The only one without one of the coma-inducing Traxxes on the point was this chemical tanker hauled by a Siemens class 152. 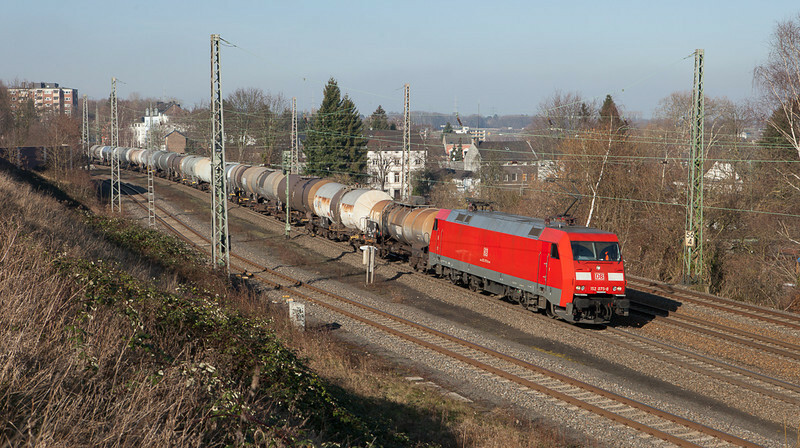 152 075 leads the 47563 (Antwerp BASF/B - BASF Ludwigshafen) through Eschweiler. The weather was a bit rubbish on the 25th but since it wasn't raining I figured I might as well scratch a shot off the "no light" list. This is the stately viaduct that spans the valley of the river Vesdre just south of Dolhain. Built in the tradition of the English railways of the era no costs were spared to create what today would be called a "super railway". The L.37 features an endless succession of bridges and tunnels constructed of a mix of granite and brickwork unique to this line. An unmodernized AM80 Break passes what's left of the "Lavoir et Carbonisage de Dolhain", about to duck into the new tunnel that bypasses the Dolhain-Gileppe stop since 2012. AM80 Break 303 on the viaduct in Dolhain-Gileppe. 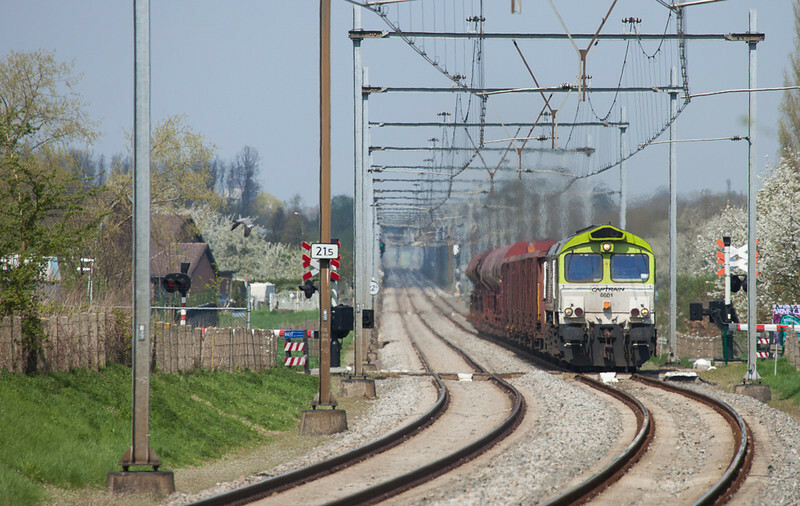 Crossrail's PET unit train between Poland and Antwerp has been a staple of the company ever since the DLC days. Running as an extra it alternates between a route through the Netherlands and one via the L.24 depending on driver availability. I caught wind of today's train taking the southern path and set out to see him even though the weather left a lot to be desired. After stopping for fuel in Montzen he had to continue his westward trek via the yard lead to Hindel as the "short lead" at Block 14 was blocked by Maintenance-in-the-Way. This was all the incentive I needed to slosh my way through the soggy pasture up to the Tunnel de la Galoppe. With the impending closure of the two remaining signal boxes at Montzen I guess this kind of move won't be happening very often anymore. What's more the vegetation up there is starting to grow back with a vengeance and come spring I doubt shots like this will continue to be possible. 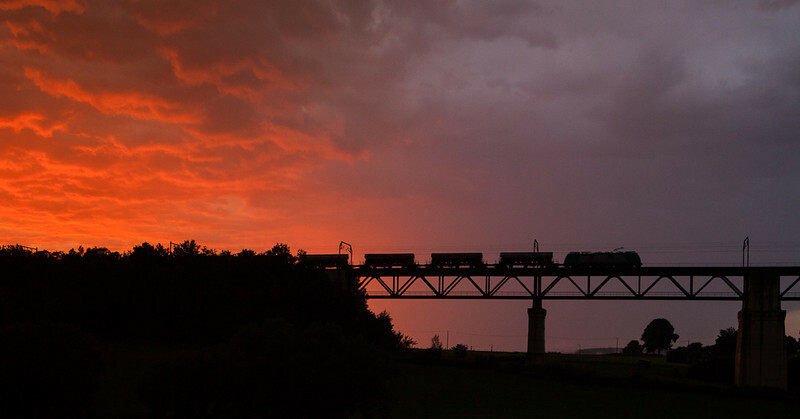 So crappy weather or not, there was a decent train and I wanted the shot. Here it is. Crossrail DE6311 "Hana" with the 48536 (Buna-Werke/D - BP Chembel) in Hindel. 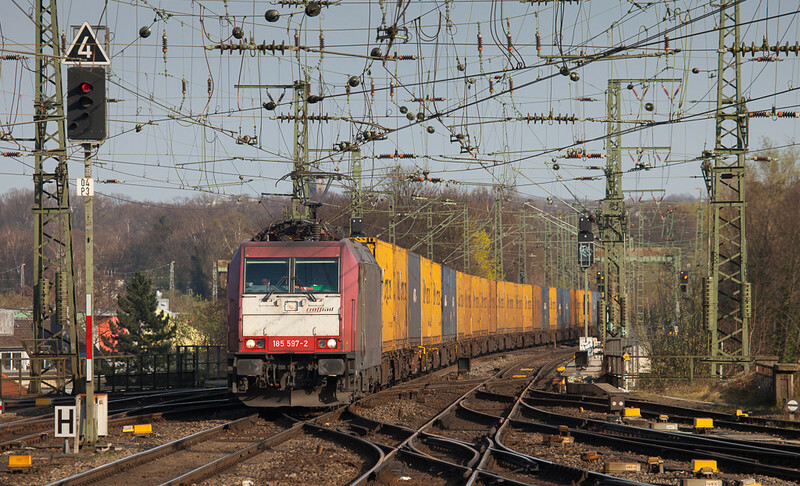 I was alerted to a Railtraxx intermodal approaching Aachen westbound and went out to catch him at the Rue d'Aix. The weather was fine if cold so bagging a few bonus Traxxes seemed like the thing to do. 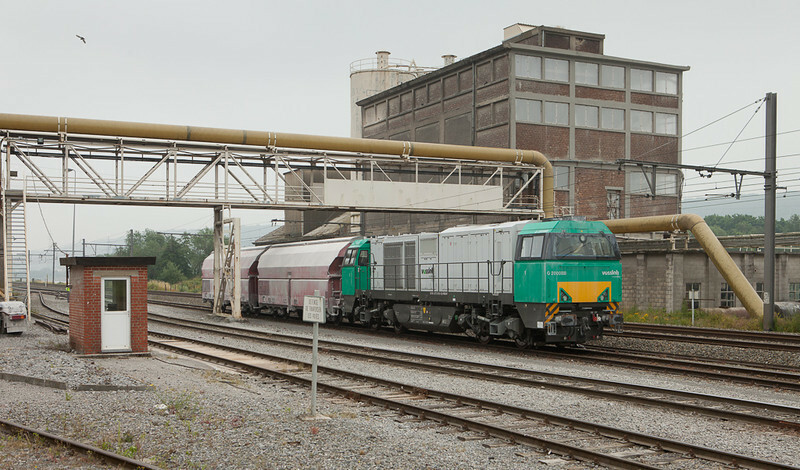 2843 is the final (hopefully) E-186 delivered to B-Logistics. She has just entered the only spot with sun on this section of the line with the coal empties from Mannheim/D in tow. Normally strong tele shots and catenary don't go well together but the harsh light and abstract geometry make this at least somewhat worthwhile. I did get the Railtraxx eventually but not before the sun had decided to call it quits. 2843 with the Mannheim/D coal empties in Moresnet at the Rue d'Aix. Nothing special today, just a view of normal traffic combined with the best wishes for a healthy and happy 2014. 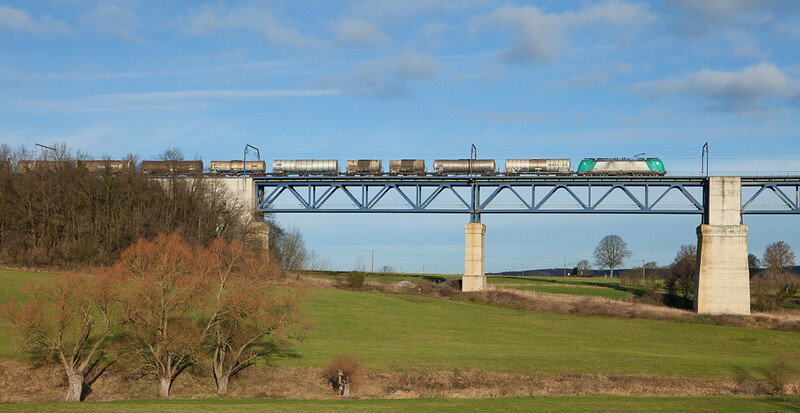 2839 with the 47563 (Antwerpen-BASF - Ludwigshafen-BASF/D) on the Viaduc de Moresnet. Today I got out for a short while chasing the DE 6313 (the 66 with the yellow nose in the above shot). I ended up at Montzen's B.14 where a little surprise was in store - a total of 5 trains, all Crossrail, had been parked in the place that usually sits completely deserted most of the time. While I'm sure this is due only to the post-holiday traffic disruptions it still was a nice surprise harking back to the busy days of the early 2000s. 5 Crossrail trains in Montzen. The weather forecast was favorable for today so I figured it would be worthwhile to shoot some window trains in the Vesdre valley. The very low sun a day before winter solstice turned many of my favorite spots into veritable black holes but Goffontaine was nicely lit. 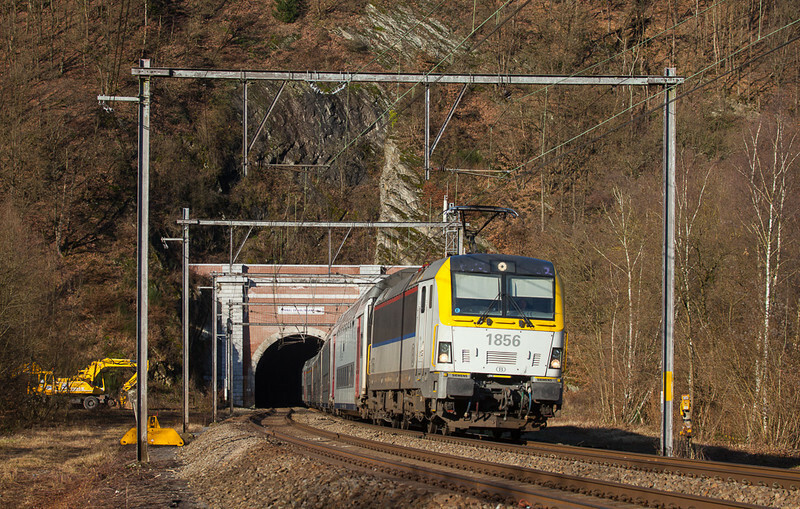 With the new double decker trains being topped and tailed finally one can shoot an eastbound at the Tunnel de Halinsart. The I11 consists always have the engine on the west end and a cab control car on the east. 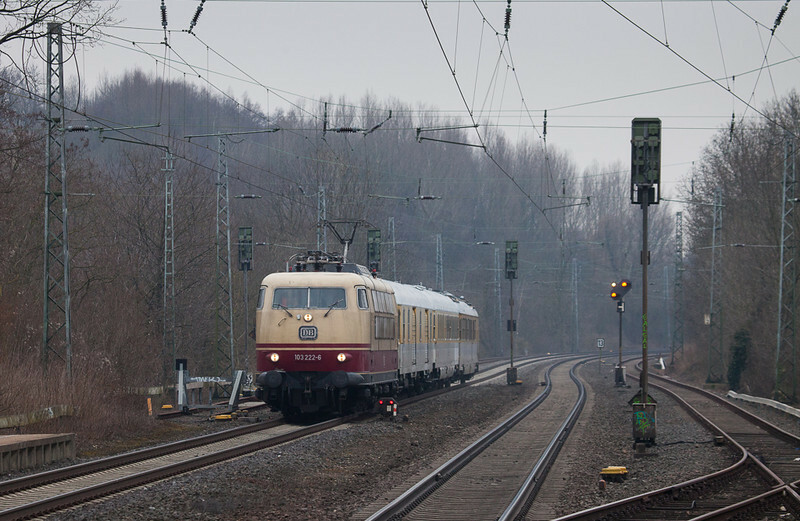 1856 with the IC 509 (09:45 Oostende – Eupen 12:45) in Goffontaine. The one thing I enjoy about winter is the possibility for night shots without having to stay up until the wee hours of the morning. The tricky part is to find a place with decent lighting and trains sitting still long enough for a time exposure. Using flashes on moving trains is a big no-no in Europe, as opposed to the US where it is quite possible to obtain amazing photos with flash. A quick trek to Welkenraedt netted this scene with an AM70 tucked away for the night in one of the old freight yard tracks that are now being used for passenger stock. As is so often the case the catenary actually does add an element of interest to the dark scene. The small posts are yard power plugs to provide juice for train heating. 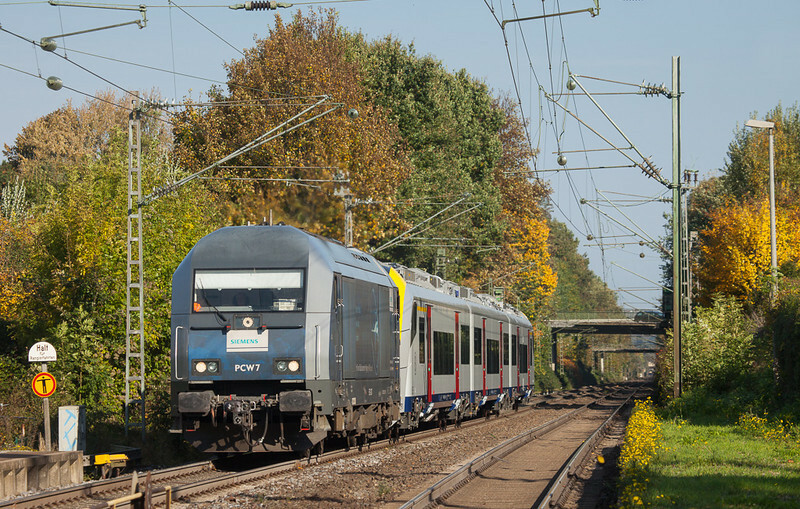 Today the new timetable went into effect and one of the changes it brings are two additonal ICs Ostende-Eupen and two sets of double decker cars running several IC-A trips per day. 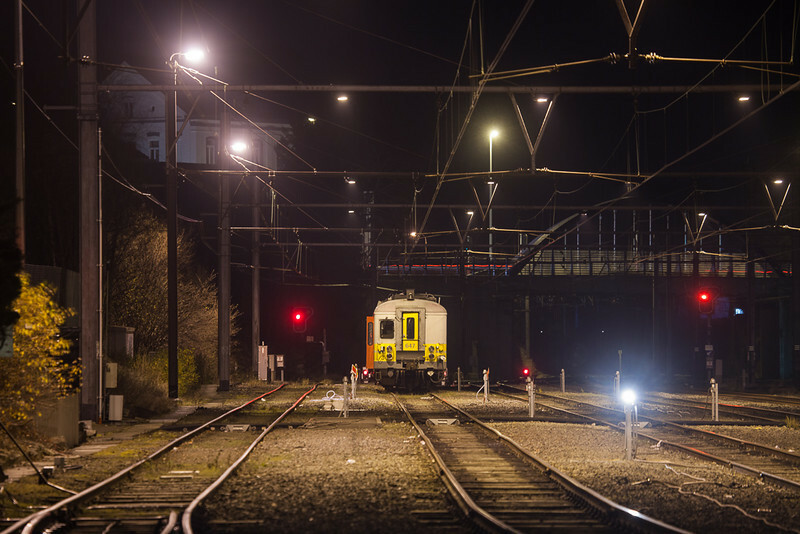 Over the past months some work had been done to raise a roof in the underground station at Verviers Central, creating enough clearance for the high equipment. 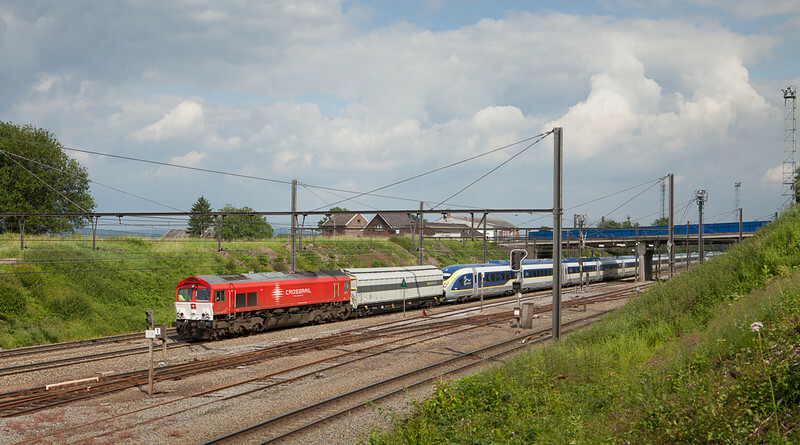 Interestingly enough the trainsets of either 8 or 10 cars are sandwiched between two HLE18s, providing ample power for the 200 km/h running on the LGV west of Liege. The reason for this is that the cab control cars failed the necessary certification. I set out for Welkenraedt to get away from the pre-Christmas madness and to capture one of these trains. 1822 leading and 1922 shoving made short work of their 8 cars as they pass the ancient Hotel Herren on what used to be the Prussian side of the Rue Mitoyenne. 1822 + 1922 accelerate the IC 509 (09:45 Oostende - Eupen 12:45) eastbound out of Welkenraedt. We're a month away from winter solstice. This is the time of year where you crank that ISO dial up to 2000 to reach a measely 1/640th of a second and hope the hogger of the train you're shooting isn't going full bore. Today's subject was the once-weekly Intercity hauled by a 25+ year-old class 120. Introduced in the 1980s this was the first production three-phase AC drive electric engine class. The original ICE power units were direct decendants in a different shell. 120 110 had already been sidelined along with other worn-out members of the class but was brought back to pinch-hit for the reliability disaster that the ICE3s are. The rest of the train seems to have equally fallen out of a time machine. Note vintage non-air conditioned cars with windows that actually open in the consist. They may not be flashy but they sure work a whole lot better than the unreliable jewelboxes DB have burdened themselves with. And really the only thing that matters on this day is a decent powerful heater. 120 110 with the IC 1918 (Aachen Hbf - Berlin Hbf) in Kohlscheid. Another one from today. A large amount of cloud moved in and obscured the sun in the afternoon. But even in bland ISO 800 light the brilliant yellows in this location go a long way to brighten up the shot. 2811 with limestone empties in Moresnet at the Rue d'Aix. Today was the calm before the storm. I had actually planned a longer outing to the south but rubbish morning weather kept me home. A glorious fall sun came out during midday so I went out to capture peak fall color before rain and 10 Bft winds forecast for Sunday would blow it away. Here then we see a location I have not been to since Infrabel put up the dreaded wires in 2008 - Nouvelaar. It's not much of a shot anymore but what the railroad lacks since the Traxxes came today nature made up for with sheer beauty. There wasn't much traffic but the horses kept me company. They don't see many railfans here anymore, a far cry from years past when the bridge was packed with foamers taking aim at the parade of HLD55s and German 225s screaming up the hill from both sides. Maybe they miss the odd apple they received. 2810 on the 40242 (Gallarate/I - Antwerpen-Oorderen) in Nouvelaar. Late October. A quick glance out the window confirmed that not going out wasn't an option. The beautiful late-fall sunshine was too good to pass up, especially with the changeover to winter time next weekend looming. This spot on the L37 is called Dolhain-Vicinal and was reactivated when Dolhain-Gileppe was bypassed by a tunnel last year. In a previous life it had been one of the places where the extensive Belgian interurban network (the Societe de Chemin de Fer Vicinaux - SNCV) interchanged with the "steam road" (Chemins de Fer de l'Etat, eventually part of SNCB). The station structure remains on the private property of a quarry, otherwise it would probably have been torn down decades ago. AM70 654+636 as L5487 (Welkenraedt - Spa-Geronstere) in Dolhain-Vicinal. It's been exactly one year to the day since this picture and again the weather is fine, the trees are showing their nicest colors, and I'm spending my lunch break on the platform at Kohlscheid. The occasion today was the transfer of another AM08 Desiro from Siemens' Wildenrath test center to Belgium. It is the final one of the new EMUs to be assigned to Atelier Traction Stockem. 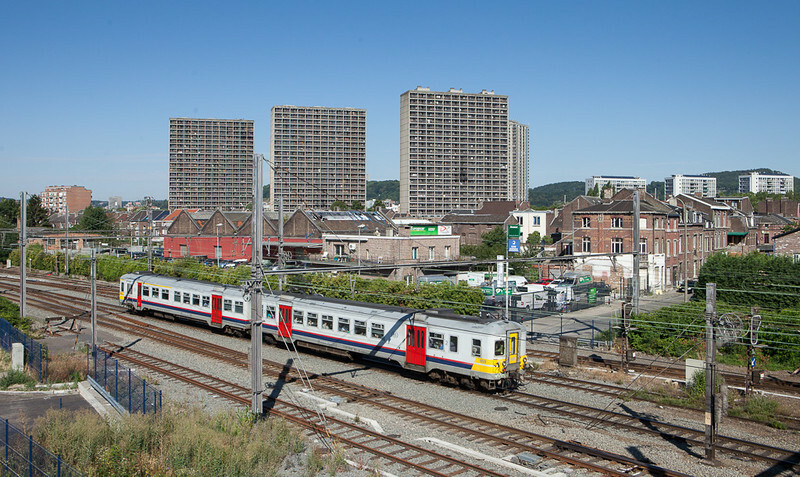 The next units will go to Charleroi. 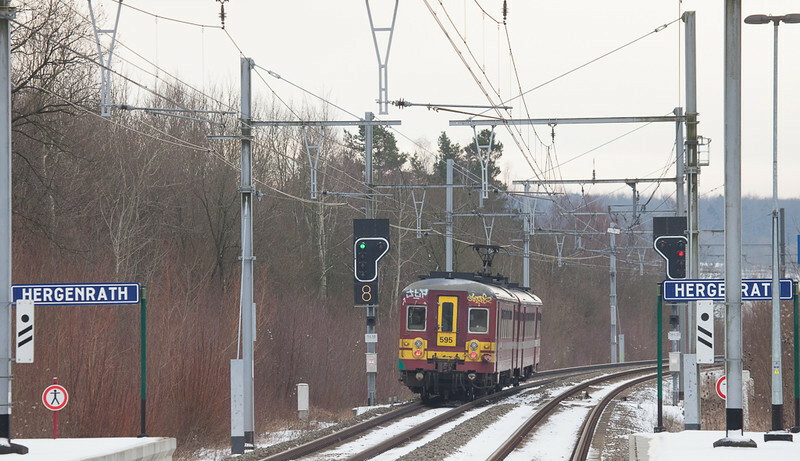 Siemens PCW7 with AM08 08555 en route to Stockem/B in Kohlscheid. Autumn is in full swing but the weather isn't really cooperating. Today started out promising enough with sun but turned gray shortly after I was able to get away from the office. Rather than pack up and go home I went over to Stolberg to shoot eastbounds against what little light was there. Just as Rurtalbahn's little V104 was dragging the lead ore loads into town a sucker hole opened up and bathed the scene in a golden cast. 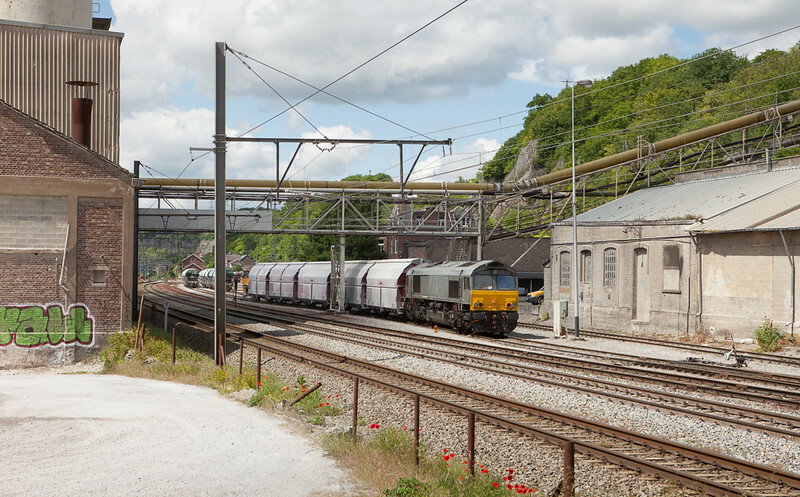 That's one of OHE's Siemens Eurorunners on the left waiting for a load of logs to come down from the hills. Rurtalbahn V104 with the 48511 (Antwerpen/B - Stolberg) approaches Stolberg. Crossrail has a new train with a very unusual routing, the thrice-weekly Geleen-Lutterade/NL to Novara/I intermodal shuttle. Originating from the new terminal built inside the DSM chemical complex it runs north to Sittard, reverses south to Vise, reverses again, and runs to Aachen West in Germany, where a third change of direction including transfer to electric power happens. With the north yard throat in Vise being out of service, it needs to go south all the way to Bressoux for the moment at least. Crossrail PB13 with the Novara-Shuttle 41667 (Geleen-Lutterade/NL - Novara/I) changing directions in Sittard. Traveling for business is sometimes good for a few train snaps as well, and such was the case with a recent trip to Stockholm, Sweden. The station at Flemingsberg affords a nice long lens-view of southbounds as they approach the station on the fast (outer) track. Here a X2000 races into the late afternoon sunshine. More photos have been added to the Sweden gallery. 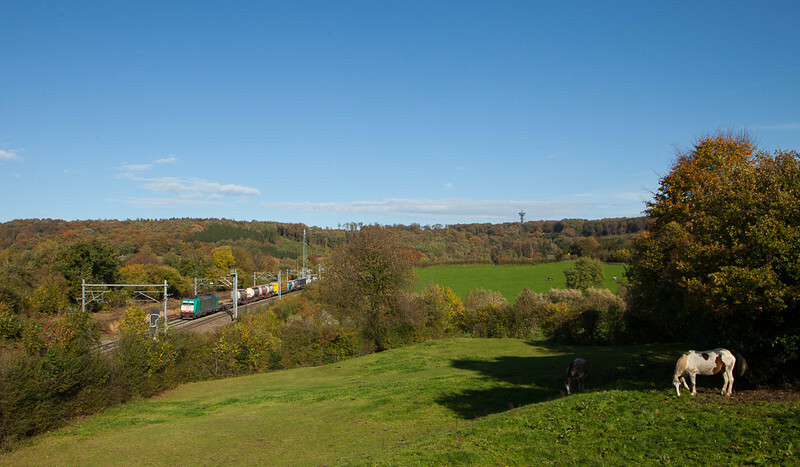 The northernmost two active towers in the Meuse valley are in view in this shot from the platform at Vise-Bas. 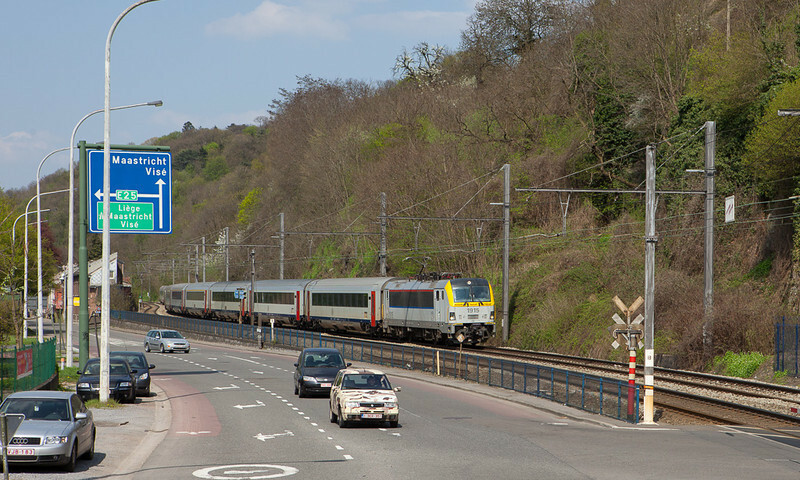 Doing as their predecessors did from 1916 onwards they exist for a single reason - to allow freight traffic coming east on the L24 on the bridge in the distance to curve down the L24/1 and merge onto the L40 for the upriver trip to Liege, Namur, Chatelet, Charleroi, and France. PE tower on the right received some fresh paint and had graffiti removed in 2013 making it look smarter than it has in recent years. 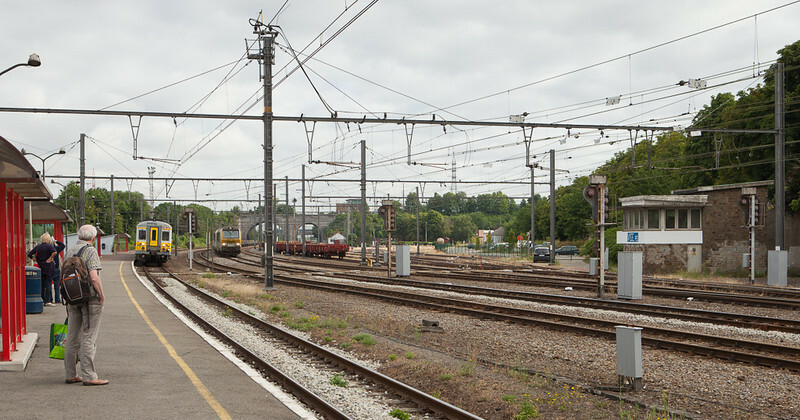 The slab train in the distance holds at the signal to allow the little AM to pass on its journey from Maastricht in the Netherlands to Liege-Guillemins after completing its station stop. 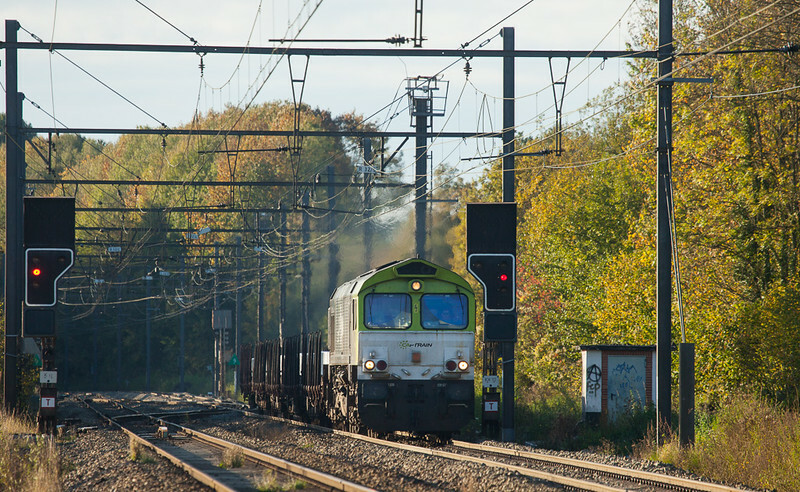 Time is running out for the little automotrices on Belgian rails. Retirements are starting even of the rebuilt units as they develop a defect. Reason enough to be somewhat more attentive of them. 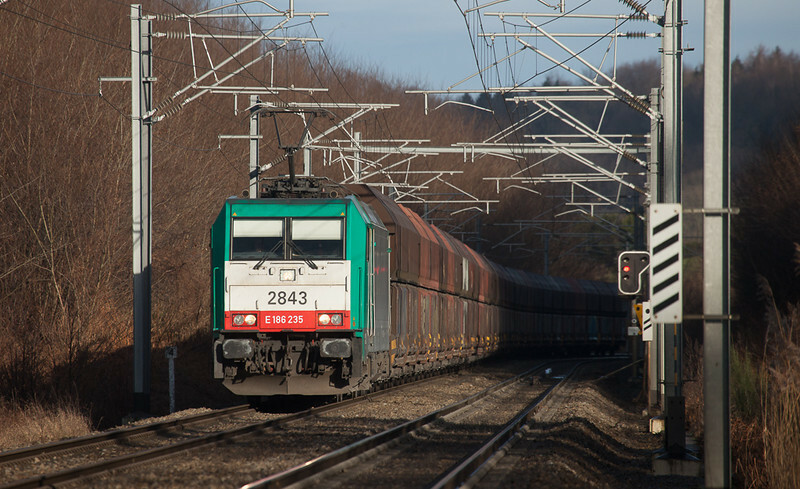 Today's trip to the Meuse valley was a bit short on freight activity anyway so here's a view of 659 passing in front of the Tours de Droixhe with evident burn holes in them. One wonders what will remain intact for longer - the EMU or the abandoned remaining 3 (of 5) public housing sins of the "le Corbusier" era. Spent a lovely day in the Meuse valley today. It's been a while since I've had a full day of foaming and it was great. 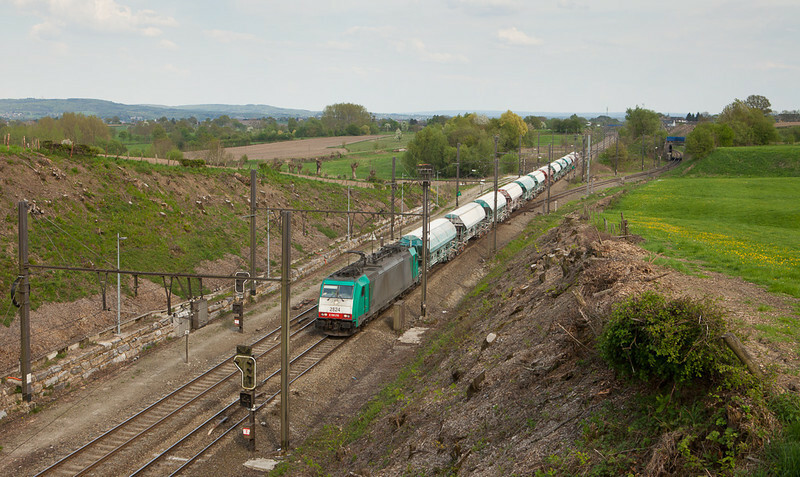 One of the primary targets was Railtraxx which shuttles short cuts of limestone between Hermalle and Kinkempois on behalf of DBS-NL who don't have enough qualified engineers to cover all their contracts in Belgium. Here their G2000 is seen after having arrived with but two empties in Hermalle, getting ready for the return trip down the still-foggy valley. 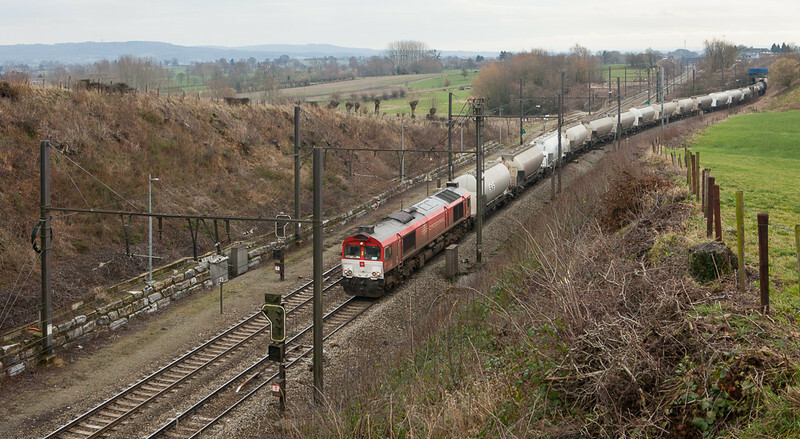 Railtraxx G2000 272 003 with the limestone empties 61401 (Kinkempois - Hermalle s/Huy) in Hermalle. 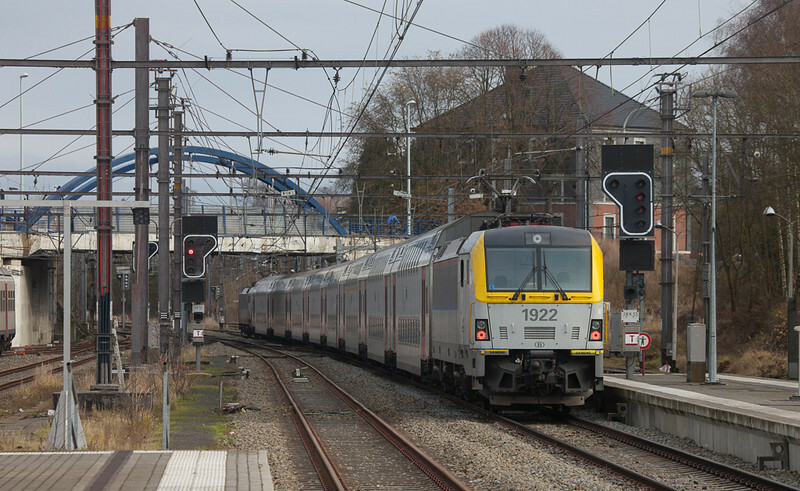 This is probably the most photographed train in Belgium today. Crossrail was booked to bring the first Eurostar Velaro to Brussels to begin certification testing in Belgium. Having gotten out of Aachen about 15 minutes early they hit the only sucker hole for miles around right in Hindel. Talk about good timing. Besides being a very long train at around 400 meters the Velaro is also looking stunning in the Eurostar paint scheme. Completing the authentic British attire of the entourage is the pair of UK-profile Railadventure adapter cars, one at each end. Crossrail PB13 brings the Velaro E320 Eurostar 4002 through Hindel as train 47518 (Aachen-West 16:40 - Bruxelles-Forest 20:00). We've had a few really hot and sunny days recently. My work schedule prevented me from taking any advantage of them so far, but when the thunderstorms hit today there was the proverbial 5 minutes of Golden Light[tm] in between two of them. Unidentified limestone train on the Viaduc de Moresnet. Summer is finally here! This week temps topped 20 degrees. I picked a Thursday to spend a few hours shooting trains, but there was virtually no traffic. A measly 3 HLE28s in 2.5 hours is nothing to write home about. At least two thirds of the traffic ran in the right direction. The cut at Hindel is starting to get green again after Infrabel's little gardening blitz. The engine is just at the point where the old L38 crossed over the L24 until it was abandoned in the 1960s. 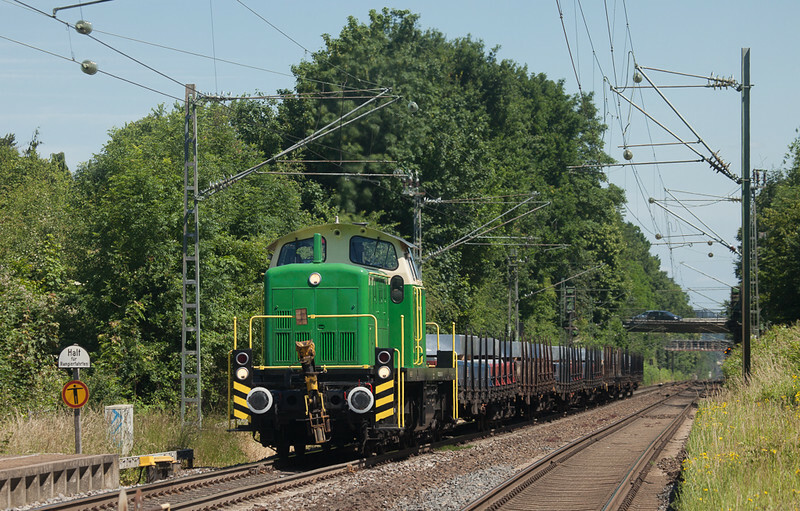 2809 on the coal empties 48562 (Mannheim-Rheinau/D - Antwerpen-Zandvliet) in Hindel. Mondays are hopeless for freight traffic around here, but I wanted a shot of the deforested area at the Tunnel de la Galoppe before the rain forecast for the rest of the week set in. This, incidentally, is the opposite view to the picture from 8-Dec-2012, taken from almost atop the tunnel portal. 2824 with the limestone empties 48566 (Oberhausen/D - Hermalle s/Huy) in Hindel. Another shot from the 25th. 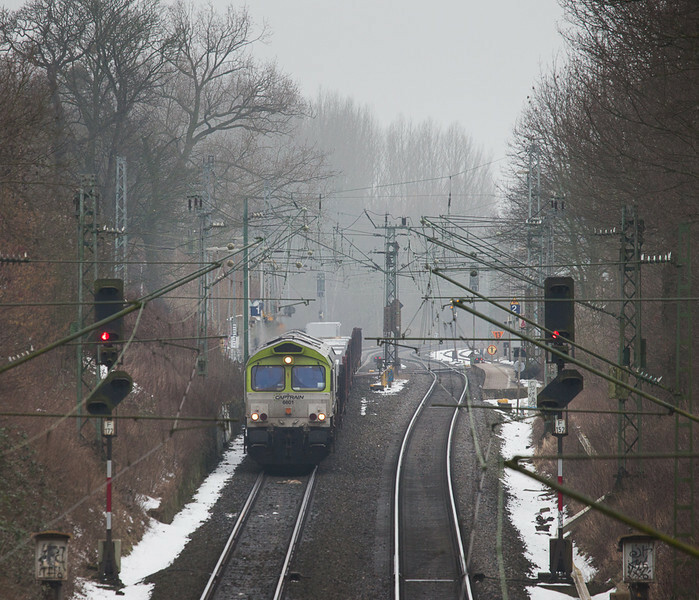 We see one of the automatic coupler-equipped class 19s on an IC-O from Vise towards Oostend. The couplers aren't functional yet pending a software upgrade which means the 19s hold down regular class 18 assignments courtesy of their standard coupler on the other end. There's a bit more in this shot than meets the eye. It was taken from about 3 meters up using the pole, enabling the camera to look over the fence otherwise obscuring the undercarriages. The added height also shows the S-curve in the tracks to good advantage. Of course it's all in the timing - a bus or truck appearing at the wrong moment would have ruined the view. Setting up the pole right next to a busy through street did give me rather more of the motorists' attention than I would have liked but I did want that shot! 1915 with IC-O in Cheratte Bas. 10 days after the frigid Stockholm experience I couldn't wait to get outside and enjoy the lovely springtime and the 26C/79F temps. The apple and cherry trees in the Maas valley are in full bloom as one of Captrain's sheds brings the coal south from the transload at Born. Captrain 6601 brings the 48871 (Born - Bressoux/B - Bettembourg-Marchandises/L) south towards Eijsden. A recent business trip to Stockholm, Sweden gave the opportunity to take a quick look at the first reinstated trolley line in the inner city, the Djurgårdslinjen onto the island of the same name. It was abandoned in 1967, reactivated for museum use in 1985, and finally saw its first Bombardier Flexity trains operate from Sergels Torg in 2010. One of them is here seen having just passed onto the island from the bridge. 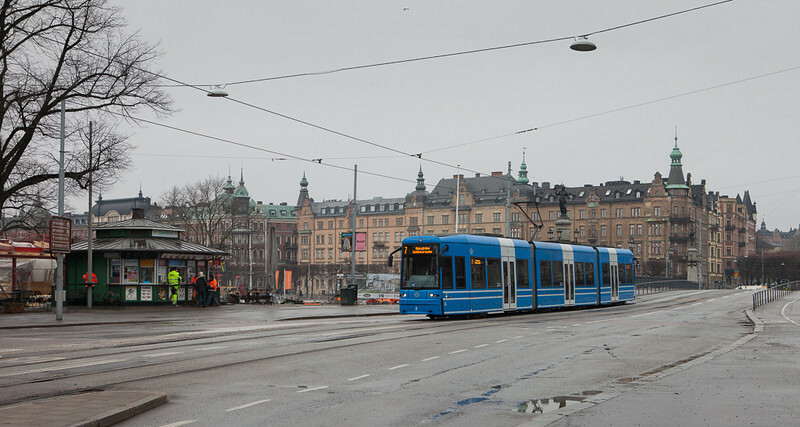 Flexity Classic on the Djurgårdsbron. 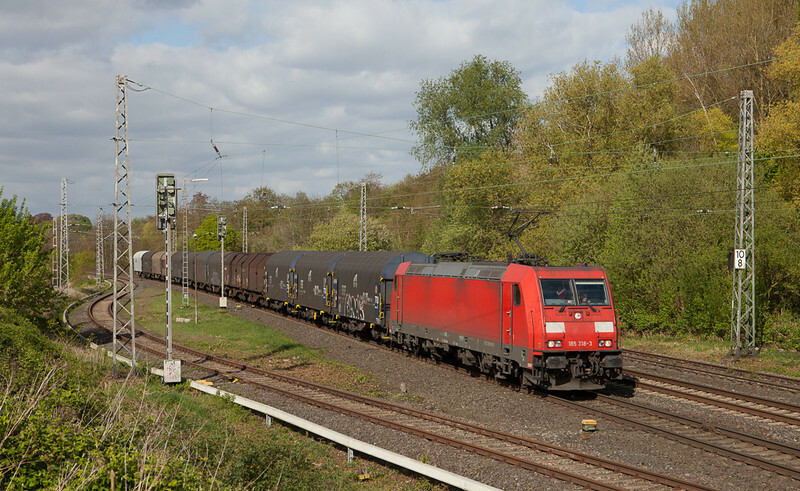 In a mirror image of and almost exactly 2 years after 14-Apr-2011, 103 222 makes a repeat appearance with a measurement train, this time headed north through Kohlscheid. The classic electrics are always a welcome sight and worth a short freeze for a picture. 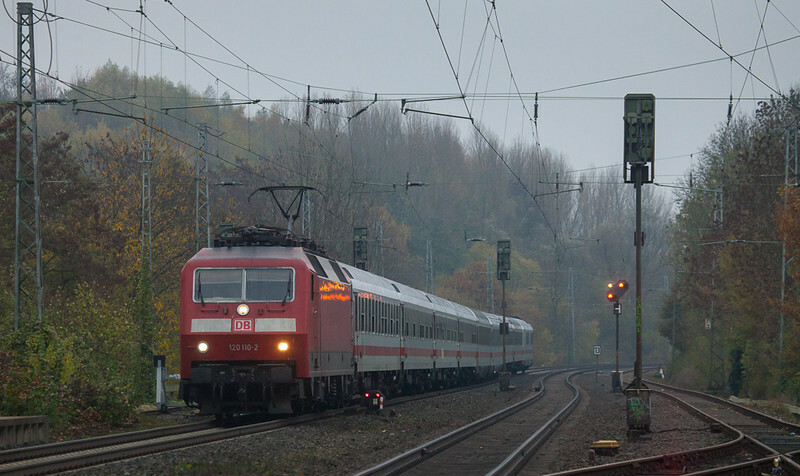 103 222 with the measurement train 94030 (KKB 8:02 - 14:52 HSDL) in Kohlscheid. Ten days on and recovery goes slower than hoped. There's still a bit of snow on the ground from this week's snowstorm and it is uncomfortably cold. 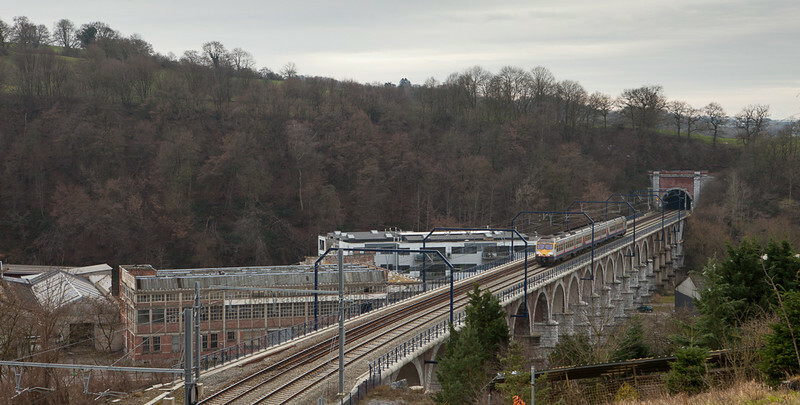 Unidentified Crossrail 66 on the Viaduc de Moresnet. If there's any one word to describe the 5th of March and following days, that's it. It started with beautiful sunshine and a record high of 18C/65F. I had high hopes for catching the trash train in nice light and set up at this motorway overpass parallel to the railroad between Heerlen and Voerendaal. In the event the train didn't run and all I got for an afternoon of waiting was frame after frame of these Stadler EMUs which make even a Plan V look interesting. 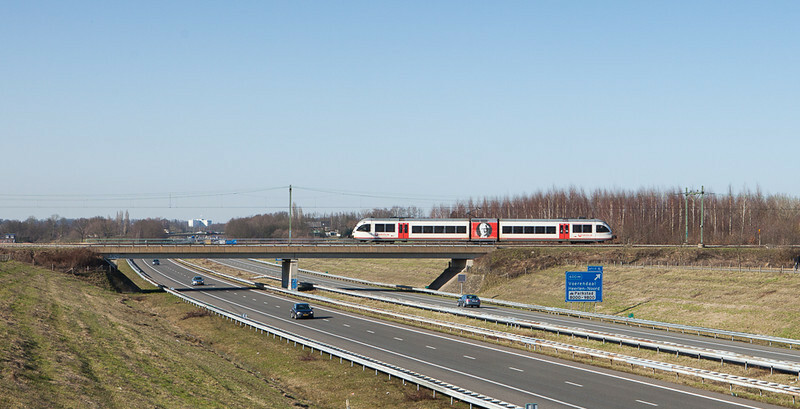 Veolia Stadler Gtw 2/6 crossing the A76 near Voerendaal station. Another Friday, another cold lunch break for the Captrain aluminum shuttle. This time from a road overpass just north of the station, showing to good effect the drastic change in grade. Last week's photo was taken from the end of the platform in the far right distance. The weatherman promises warmer temperatures and even some sunny skies for next week so hopefully this long and dark winter is drawing to a close now. Apparently we've received the least amount of daylight since measurements began in 1951. 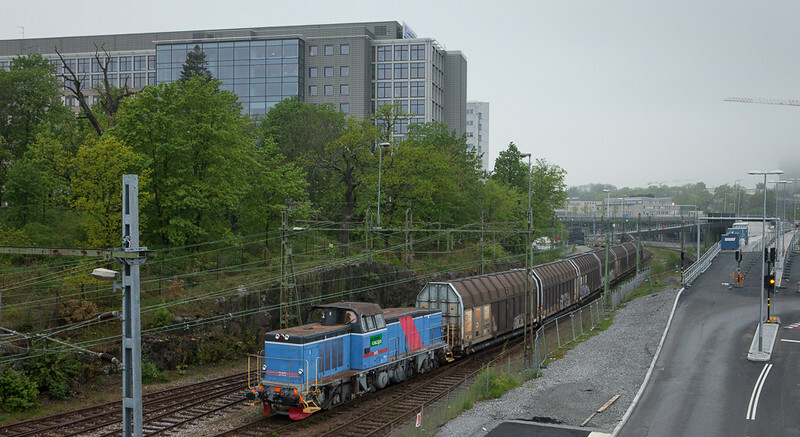 Captrain 6601 brings the aluminum train 48515 (Kinkempois/B - Nievenheim) through Kohlscheid. I was quite disappointed when Captrain lost the coke contract last December and their attractive green-gray 66s were making themselves rare in this area. There had been rumblings of a reroute of a once-weekly flow of aluminum slabs from Dunkerque to Nievenheim, and they started running last week. SNCF-Fret used to exchange them to HGK in Cologne for the remainder of the trip. Now they hand them to Captrain in Kinkempois who takes them over the L24 to Aachen-West and then up the 485 to their destination in the Düsseldorf area. This then is the second train, caught in abysmal light (hence the b&w treatment) and a freezing northeasterly wind during my lunch break. Spent an hour hanging around Aachen West today in the freezing cold. Being a Saturday there wasn't much freight traffic, but the overcast weather at least gave me a chance to shoot an angle I had long wanted to try. This is looking southwest towards Aachen Hbf. 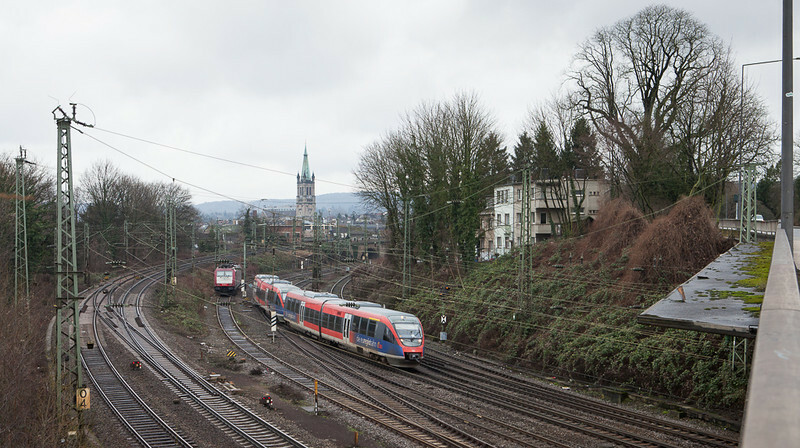 The two leftmost tracks are the L24 climbing uphill towards Montzen/B, then there's an engine pocket, the two main tracks towards Aachen Hbf, and on the far right the "hill track" which is a shortcut for trains coming into town on the KBS485 from the north and rejoins the L24 westbound main just around the curve. Unlikely to win any prizes this shot just shows a bit of the varied infrastructure around town that will be 100 years old next year (construction having begun at the outset of World War I). The church spire in the distance is St. Jakob, itself only finished 25 years previous. This picture will rather soon be symptomatic for the old "automotrices doubles" - their final departure isn't too far off. But for now 595 still has to earn its keep as it is making the circuit on the "AIXpress" between Liege and Aachen/D (Aix-la-Chapelle in French) on this cold Saturday. If you've followed my stuff here you'll know that I rarely consider a picture satisfying unless it has a sense of location and shows something more than just a train. The former is hard to miss in this one, and on today's railroads with their ever vanishing infrastructure signals are an obvious prop. This one shows there are at least two clear blocks ahead and a speed limit of 80 km/h for the diverging route at "Bifurcation Hammerbrücke" towards Welkenraedt, the little AM's next stop. AM66 595 departing Hergenrath for Welkenraedt. Postscript: 595 was retired less than two months later, in March 2013, and being used as a parts donor for other AMs in Kinkempois.